One area of inefficiency I have slowly been addressing over the past several years is that of breathing. The vast majority of my teachers were, either implicitly or explicitly, advocates of the “breathe low” approach to breathing when playing. The idea here is that the primary movement when inhaling should take place in the abdomen, as the diaphragm flattens and displaces the internal organs and such, and the lungs somehow expand downward. Movement in the upper chest (where the lungs actually are!) is generally discouraged, a practice that probably began as an overreaction to the error of moving too much in the shoulders. While I rarely heard the idea of a firm or tense abdomen promoted, the “breathe low” approach tends to lead to that result, or at least it did with me. While this had little negative effect upon me in my pre-injury days, in recent years the extra tension in my abdomen exacerbated the effects of certain structural imbalances that, for better or worse, I have to deal with. Enter David Vining, whose What Every Trombonist Needs to Know About the Body I have reviewed here before and whose publishing company, Mountain Peak Music, recently released my own book on low brass doubling. After experiencing a nearly career-ending battle with Focal Task-Specific Dystonia of the embouchure, Vining researched and developed his own treatment plan, rebuilt his playing and career, and subsequently began a renewed teaching focus, helping both students and professionals how to recognize, eliminate, and avoid the kinds of habits which lead to challenges like dystonia. As a result of Vining’s book and several lectures and master classes of his that I have attended, I began to retool my teaching and playing regarding the use of the body in several respects, including breathing. I abandoned the “breathe low” mantra in my teaching after learning that the lungs do, in fact, expand in all directions simultaneously rather than “from the bottom up” as is often taught (there is movement in the abdomen, just not exclusively so), but eliminating the habits of breathing that way and of introducing excessive abdominal tension into the mix in my own playing took much longer, and in fact is an ongoing process. Realizing that my own breathing was still not matching in practice the ideals I espoused verbally, I purchased a copy of The Breathing Book last summer. In just 32 pages alternating text and playing exercises applying the text, Vining walks the player step by step through understanding how the body works and then applying this knowledge to actual playing. Breathing is the main focus of the book, but its instructions necessarily touch every aspect of one’s physical approach to the instrument. The entire book can be completed in a little over an hour; less if the text is not thoroughly read (though it should be, at least the first few times). My practice over the past several months has been to replace my regular daily routine with this book once weekly or sometimes every other week, and I have begun recommending that my students do the same. I cannot overstate how useful this book has been for my playing. While I encountered very little information that was completely new to me, the systematic presentation and application of the ideas introduced here have made it incredibly useful. Perhaps most importantly, through regular use of this book and application of its ideas to all playing, I have eliminated several areas of unnecessary tension, including in the abdomen. This has yielded expected benefits in tone quality and phrasing; an unexpected benefit has been a reduced susceptibility to the effects of performance anxiety. Nervousness often leads to an increase in muscle tension and other inefficiencies that are already there; in the absence of such tension, the effects of “nerves” are largely eliminated. 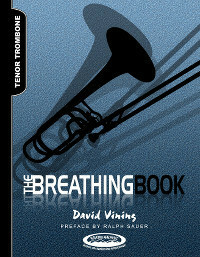 In a conversation we had at a conference several months ago, David mentioned to me that he hoped one day The Breathing Book (which has editions for all brass instruments as well as the oboe) would be rendered unnecessary because the correct approach to breathing would be known to practically all teachers, performers, and students. While I wish that this will someday be the case, I’m sure that books like this will always be needed. Even with the best and most physiologically accurate instruction, the tendency of diligent players to make things harder than they are will always lead to various kinds of incorrect approaches to breathing and other fundamental issues that will need to be addressed. Happily, the brass community now has this book and others like it to help players get back to the right place when inefficiencies creep into their playing. This really is a great book. Order your copy today! This entry was posted in Books, Breathing, Doubling, Playing Fundamentals, Teaching Low Brass. Bookmark the permalink.